Approximately 5 million Americans are estimated to be living with the progressive, incurable, fatal brain disorder known as Alzheimer disease (AD). By 2050, this number is projected to quadruple and affect 14 million U.S. adults aged 65 years of age or older. AD, which accounts for between 60 percent and 80 percent of all cases of dementia, destroys brain cells, causes memory loss and confusion, and worsens over time until patients eventually lose the ability to work, walk, and communicate. 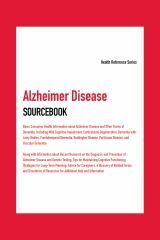 Alzheimer Disease Sourcebook, Seventh Edition provides updated information about the causes, symptoms, and stages of AD and other forms of dementia, including mild cognitive impairment, corticobasal degeneration, dementia with Lewy bodies, frontotemporal dementia, Huntington disease, Parkinson disease, and dementia caused by infections. It discusses the structure of the brain, how it changes with age, and the cognitive decline and degeneration that occur in dementia. Facts about genetic testing, cognitive and behavioral symptoms, AD clinical trials, and recent research efforts are also included, along with information about legal, financial, and medical planning and coping strategies for caregivers. The book concludes with a glossary of related terms and directories of resources. Part I: Facts about the Brain and Cognitive Decline provides information about healthy brain function and examines changes in cognitive functions and memory that occur during the typical aging process. Facts about the types, symptoms, causes, risk factors, and prevalence of dementia—a brain disorder that significantly impairs intellectual functions—are also included. Part II: Alzheimer Disease (AD): The Most Common Type of Dementia discusses Alzheimer disease (AD), an irreversible and progressive brain disease and identifies the signs, symptoms, and diagnostic stages of this disorder. Information about the role that genetics, brain injuries, weight, and substance abuse play in the development of AD is also presented, along with facts about younger-onset AD, a form of the disease that affects people under the age of 65. It also discusses the factors that influence AD risk, such as alcohol and nicotine. Part III: Other Dementia Disorders identifies types, signs, and symptoms of dementia other than AD, including mild cognitive impairment, corticobasal degeneration, dementia with Lewy bodies, frontotemporal disorders, Huntington disease, Parkinson disease, and vascular dementia. It details various causes of dementia, such as AIDS, cancer, delirium, and other diseases. Part IV: Recognizing, Diagnosing, and Treating Symptoms of AD and Dementias explains neurocognitive and imaging tools used to assess and diagnose dementia, such as positron emission tomography, single photon emission computed tomography, magnetic resonance imaging, and biomarker testing. Interventions used to manage AD and other dementias, such as medications for cognitive and behavioral changes, are identified, and information about participating in AD clinical trials and studies is included. An explanation of recent developments in AD research is also provided. Part V: Living with AD and Dementias describes strategies for maintaining health and wellness after a dementia diagnosis. Patients and caregivers will find information about nutrition, exercises, and dental care for dementia patients, tips on telling someone about the diagnosis, strategies for slowing the rate of cognitive decline, and advice on pain, sleep problems, and sexuality in people with dementia. Alternative medicine therapies for cognitive functions are also discussed. Information about Medicare and financial, legal, and health care planning is included. Part VI: Caregiver Concerns offers advice to those who care for people with AD or dementia. Strategies for coping with challenging behaviors, communicating, and planning daily activities for someone with dementia are discussed, along with tips on creating a safe environment at home. Caregivers struggling to control frustration and cope with fatigue will find information about respite, home health, and nursing home care, as well as suggestions on evaluating difficult health decisions near the end of life. Part VII: Additional Help and Information provides a glossary of terms related to AD and dementia and a directory of organizations that provide health information about AD and dementia. A list of the Alzheimer Disease Resource Centers across the United States is also included.